NASA astronauts Douglas Wheelock and Shannon Walker, and Russian cosmonaut Fyodor Yurchikhin have landed back on Earth in their Soyuz TMA-19 spacecraft. The trio touched down in the central steppes of Kazakhstan at 11:46 pm EST (04:46 Friday GMT). Meanwhile, ISS managers continue to refine the visiting vehicle manifest, which now reaches deep into 2012. 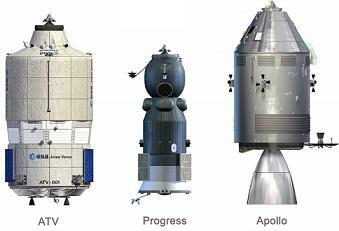 The Soyuz Vehicle consists of three modules: the Orbital Module, the Descent Module (DM), and the Instrumentation/Propulsion Module (IPM). All three modules nominally separate simultaneously, shortly after the deorbit burn is completed – at around 140 km altitude. 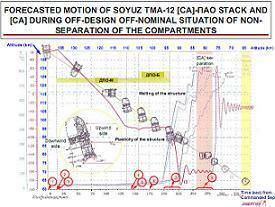 The two ‘off nominal’ re-entries in 2007 and 2008 were the cause of separation failures on the modules, thus initiating the ballistic return for their three person crews. However, no issues have been suffered with the vehicle since an investigation found that the most likely cause of the previous failures related to an open the latch located at ‘Plane I interface’, much to the relief of all concerned, not least NASA, who will be relying on the Russian vehicle for several years after the retirement of the space shuttle. The investigation findings noted issues with the long-term exposure to electromagnetic emissions on-orbit, and their potential to cause issues with the pyro bolts, came after an extensive investigation that included the removal and return of one pyro bolt from Soyuz TMA-12. Wheelock, Walker and Yurchikhin only have a matter of hours to prepare for re-entry – unlike the several days it takes for a shuttle orbiter to return home – with hatch closure occurring on schedule at 10:14 pm GMT. The closure of the hatches did not suffer from any problems, following the Soyuz TMA-18 incident, caused by an issue with a microswitch between the spacecraft and the MRM-2 (Mini Research Module-2). In preparation for entry, the crew were already wearing their Russian Kentavr anti-G suit under their Sokol suits and had already ingested fluid-electrolyte additives to prepare their bodies for the rigors of returning back into Earth’s gravity. The vehicle undocked from the ISS at 1:23 am GMT. Once back in the atmosphere, the pilot parachute (0.62 and 4.5 square meters), drogue chute (16 sq.m.) and main (518 sq.m.) chutes will slow the vehicle’s decent. Just before the landing six small rocket engines behind the heat shield will fire, resulting in a landing speed of 6-7 meters per second, slowed down to 1.5 meters per second by the retro fire. Airplanes and helicopters are on duty around all estimated landing spots – 12 in total – covering the nominal landing zones, and also at greater distances, in the event of a ballistic landing. The trio landed about 78 km away from Arkalyk, Kazakhstan, at 4:46 am GMT. The Soyuz TMA-19 occupants missed out on the arrival of shuttle Discovery, after she was delayed by trouble relating to her External Tank (ET-137). This delay led to a transfer of duties – relating to robotic support of Discovery’s ULF-5 mission – to Scott Kelly, who is now commanding to the ISS. The orbital outpost is now reduced to a three-person crew until mid-December, when Catherine Coleman, Paolo Nespoli and Dmitri Kondratyev are set to arrive on Soyuz TMA-20 – scheduled to launch on December 15 – to round out the outpost’s Expedition 26 crew. This marks a busy period for the ISS, with the second flights of the European ATV and Japanese HTV resupply vehicles, a COTS test of SpaceX’s Dragon spacecraft, along with the prospect of rescheduling the flights of Discovery and possibly Endeavour (STS-134). 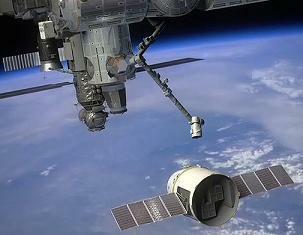 “Upcoming launches: It is going to be a busy winter and early spring at ISS central! In addition to ULF5 in Dec and ULF6 in Feb (currently), there is also a scheduled JAXA HTV2 and ESA ATV2 launch in the same time period,” added the 8th Floor. Even without the current uncertainty regarding the STS-133 and potentially STS-134 launch dates, scheduling considerations were already being worked by Station managers at the Johnson Space Center (JSC) due to the specific requirements of the cargo vehicles. “Update Increment Definition and Requirements Document Flight Program, to Add Increments 29 and 30 and Update Dates in Increments 26 through 28. This was the latest update to the Flight manifest,” noted Space Station Program Control Board (SSPCB) documentation (L2). 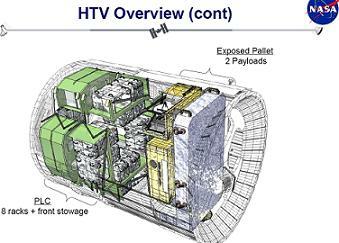 “Some of the challenges: HTV2 unberth delay would require ATV2 docking delay. ATV2 launch delay would require a ULF6 (STS-134) launch delay. Both HTV2 and ATV2 will be in free flight at same time (Need to coordinate TDRSS (Tracking and Data Relay Satellite System) usage). According to the associated long-term schedule manifest (L2), ATV-2 is scheduled to launch on February 15, docking on February 26, which follows on from HTV-2’s launch on January 20. HTV-3’s launch is now realigned to January 20, 2012 – with capture/berth five days later, before unberthing on February 24, 2012 – which is currently under review. ATV-3 will follow with a February 29, 2012 launch. By this time, the manifest shows SpaceX will have completed its second operational mission to the ISS, with Orbital’s Cygnus set to follow with a launch date of March 5, 2012, docking three days later – marking a very busy start to 2012. A full outline of the expansive schedule will be listed in upcoming articles on the commercial and partner country vehicles.